A beautiful Monday wishes to all of you. I'm taking you straight to the dessert today as I've got some mission to be accomplished here. Lol, it's none other than the novels I've been hooked to lately. I love puddings anytime...whether it's soft and creamy or the tender types. Can't really remember when I last made this Corn Custard Pudding. I craved for it, so made it right away as I had a can of Cream Style Sweet Corn available on my shelf. Mix all the above ingredients except for corn in a heavy bottomed sauce pan until the custard powder dissolved. Place the pan over low heat and add cream corn. Keep stirring over low heat until the mixture becomes thick and shiny. Do not leave the mixture unattended, or you'll see a burnt bottom. Once the mixture has turned thicker, turn off the heat. Pour the batter into cake tins or moulds. Cool at room temperature until it hardens. You may store in refrigerator later. 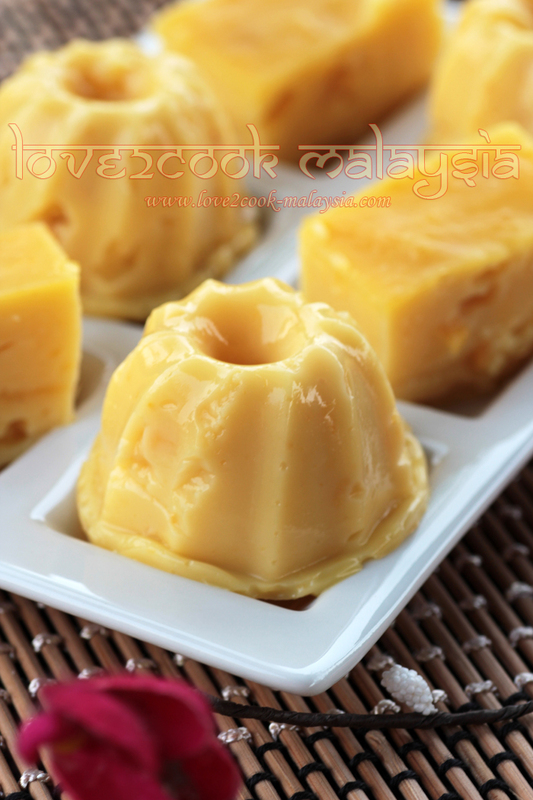 its so yummy, it has long time i make this puding. hmmm.. wanna do lah. dah lama tak mkn puding..mintak sebekas.. This totally looks so yummy! Wow I never knew you can make custard with cream style can. Wow thanks. Weeee..sedapnya puding ni..lama sudah tak buat puding...tumpang makan je la kat sini..nyam nyam.. This looks delicious...very cute presentation. dear...I'm drooling here...what gorgeous clicks ! loved the corn pudding ! nampak kuih ada jagung nie mmg tak tolak..suka korek korek cam Ika..suka suka!!!! haven't had this custard in a long time. I was just wondering this morning what to do with the 2 stalks of corn in my fridge.. maybe could substitute cream corn with fresh corn? Hi Love, very refreshing pudding. Lovely picture too. Babes.. this looks so very delicious!! These should be called Temptation Plus. my all time favourite!! yummy! this looks awesome! I would love to try this dessert!! 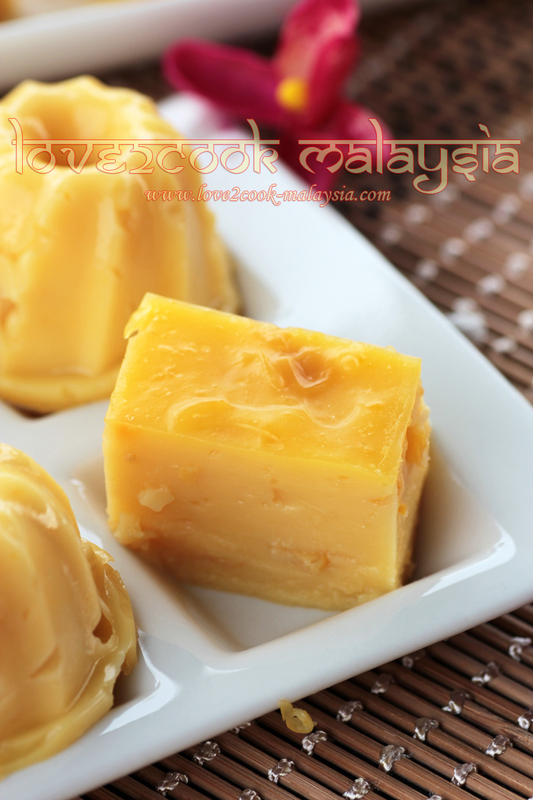 I love corn puding but never seems to get it right. Either too soft or hard. Will try your method. Thank You. Hi LOVE Dearest......OMG...this is a favorite ..especially my Along's....must be very creamy with lots of coconut milk ya!! !...And Dear I miss you and your drooollll...hehehhe...Your kids have grown up....alot since the last time I was at the window....How time flies!! !Feels good to be back....Daaa for now & TQ ya! i love pudding, thank you for sharing this. i will try to make this recipe maybe this weekend. 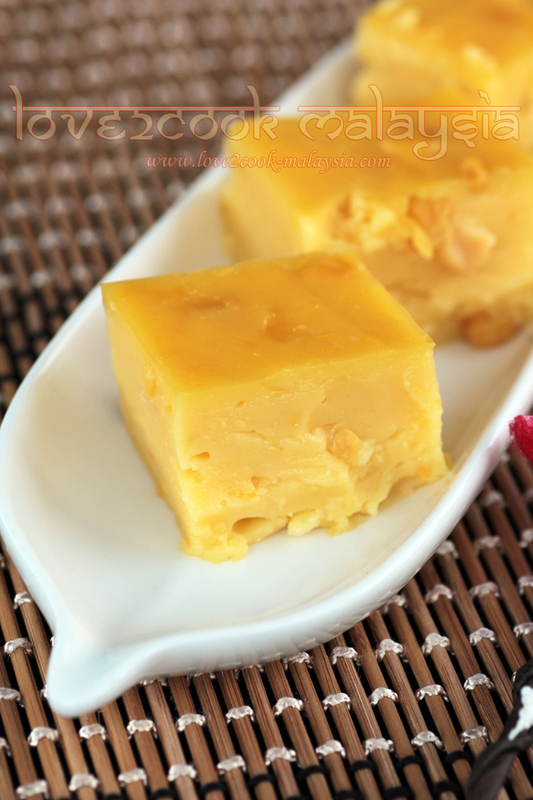 I am not sure is this is the corn kueh I like to eat when I was a kid，it look really similar. I must try this out one day. just wonder 1cup of custard powder means how many? yup, i just wanted to ask..1 cup is how many ml? 1 metric cup is 250ml.. I loved all your pudding recipes especially this one. didnt knew that custard is so simple. i am going to try making it today. hopefully, my 1st attempt will be successful. Wish you all the best ya! Have patience in stirring the mixture. I am so happy to stumble upon our lovely blog. I also enjoyed your beautiful photographs of your food. Anyway, I've been looking for this corn custard pudding for a long time. Thanks for sharing. Keep stirring over low heat until the mixture becomes thick and shiny - roughly how long? The batter should be thick and creamy ...do not stir until it's hard to stir further. Stir over low flame. Can i know how big is the portion and how many people can be served ? Hi,tried your recipe and it turned out amazing.thank you so much.